On a recent flight from Halifax to Montreal, the Jehovah’s Witness in the seat next to mine couldn’t help but express near disgust at the concept of God as Trinity. “It just doesn’t make sense.” Wherever she is now, I hope she gets to read Johnson’s book. 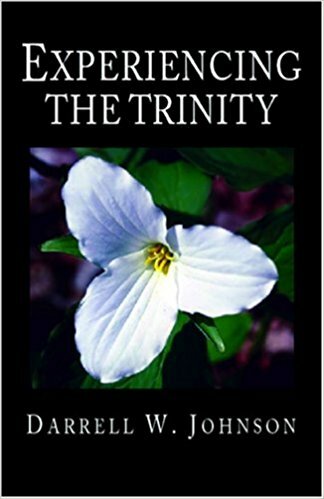 The author is spot on: it is true the Trinity is a mystery but it is not an absurdity! The following is adapted from a Devotional Reading Report submitted as part of my Master of Arts in Global Leadership (MAGL) program at Fuller Theological Seminary. May this give you a good foretaste of Johnson’s small book with big impact. Grab it! Johnson, Darrell W. 2002. Experiencing the Trinity. Vancouver, BC: Regent College Publishing. I began devotionally reading this book sympathizing with Thomas Jefferson as it seemed quite noble to follow the “simple Jesus” too (Johnson 2002, 13-14) until I realized that, like the early Christians who wrestled with this mystery, a true experience of God in his fullness, invariably leads one to the “complex trinity” (14, 32, 54). This made me understand even more deeply not only the title of the book, Experiencing the Trinity (emphasis mine), but also affirmed my conviction that our theologizing must emanate out of our experience, not just high “ivory tower think-tank” (18, 30) or armchair philosophizing. Such profundity, that “at the center of the universe is a relationship,” (37) a threefold community for which I was created and redeemed (37) and whose mission I am on—to bring in the rest of the party. Inasmuch as to the mortal mind this relationship may be “a riddle wrapped up inside a puzzle and buried in an enigma” (37) I truly appreciate Johnson not rubbishing the difficulty in trying to comprehend this mystery by affirming that “Yes, thinking about God as Trinity is hard work.” (38) What I found curious was that the early church “did not formulate the doctrine of the Trinity in order to resolve the mystery of God’s self-revelation, but rather to preserve that mystery” (40). O how I pray that my conviction will be as strong as theirs! While umpteen analogies from nature try to and fail, to varying degrees, to capture the awesomeness of His majestic three-foldness, it is a stark reminder that the Trinity is not a natural phenomenon but supernatural (47). Dr. Roger Nicole’s diagram (41) has been the most helpful illustration that I have ever come across of both what the Trinity is and what it isn’t. This chapter got me skipping like a lamb in my spirit, to recognize the most esteemed invitation I’ve ever received in my life: “God draws near to [me] in such a way as to draw [me] to himself within the circle of his knowing himself” (60). Wow! God’s invitation stuns me. First, that such a high and mighty one would open his heart and hands and stoop so low to literally invite me into his inner circle, rendering himself so vulnerable. But then secondly, it shames me to realize how not vulnerable I want to be towards him, let alone others not quite like me! I love the ‘circle’ metaphor because a ring really has no beginning or end; it is eternal and entire—God eternally knowing and loving, worshipping and missioning. Not being a lover but a co-lover (62) with God of himself (64-67), of one another (67-68), and of the world (68-69) is a yoke I gladly embrace (66). Stop and think for a moment: not only is God love, but “the mystery is that long before any human being came into the picture God was already love. God had already existed as a community of love” (62-63). This thought deeply saddened me that today humans think we are not only the originators but definers of love. That must totally break the heart of the relationship at the center of the universe! What a burden lifted that I am neither the originator nor the driver of the wheel of worship (65-66). Surely God appreciates my worship but he is really not in need of mine! This thought made a lot of rounds on FaceBook when I shared it with my friends, especially worship ‘leaders’ who claim “worship is the only thing God cannot do for himself,” as if he needs anything, let alone us! It had never occurred to me that “we do not have a direct relationship with each other. Our relationship is always with each other in and with the Trinity” (68). With this understanding of ‘us-ness’ (62, 67) one cannot help but really appreciate why unity of believers was such a key prayer of Jesus and how come it is by our love (John 13:35) and unity (John 17:23) that people will really see and believe the Gospel—they see God! Johnson’s assertion that it is neither just “because of” nor just “through” but that it is in this community at the center of the universe that I live and move and have my being (75) is profound. No wonder Jesus said apart from Him I am and can do nothing (John 15:5). O happy day! I have been submerged into an eternal ring of intimacy, joy, peace, servanthood, purity, power and creativity! It is quite true that “the more mysterious the emerging landscape, the further they must reach for appropriate language to describe it” (90) but this makes that one heavenly word which is able to capture it all even more profound: Holy! (25) I too kneel like Paul in prayer (90), undone in worship and simultaneously asking to experience this fullness of “all that makes God be God” (101), knowing full well that this can only be done in him by him. What a life-transforming journey walking through this book has been. Ranging from knowledge of the Trinity to experiencing the Trinity, it is time to stop cheating myself (103). More than what a fuller understanding and articulation of the Trinity would do for my apologetics is what it has already begun to do in my own personal devotional life; more firmly rooting and grounding me (97) in the faith of my fathers and giving me a confidence in this divine mystery-but-not-absurdity (40), and certainly no longer a personal “intellectual embarrassment” (13). Holy!